team are getting into their stride and have only lost one game. The U14A’s have continued their winning streak and the U15B’s have won all their games this half term. In Hockey, the teams have been mostly undefeated. The U13 team has not lost a game yet and the U15 team were delighted with their 4-0 win over St Teresa’s. We have continued to offer a wide range of extra-curricular experiences for the girls and this half term has seen them take part in swimming, cross country, biathlon and gymnastics. The Junior Swimming Team had the opportunity to swim in galas at St Teresa’s and Aberdour. A team of U11’s went to Guildford High for their ‘Splash and Dash’ event and Jessie S came fifth in the running. At a Gymnastics event organised by St Catherine’s, Daisy S and Louise T were joint second and Louise D was third. The U15 Gymnastics team took part in the Surrey Floor and Vault Competition for the first time and displayed an excellent standard of routines and vaults. In Cross-Country, the Junior and Senior teams took part in a relay race at St Mary’s, Ascot where the U11 team were third. 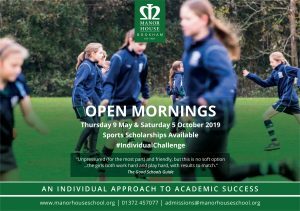 Manor House hosted its own Cross-Country Competition and in the U11 age group Elin R was second and Jessie S was third. In the U16 race, Verity P-J won and Elanor T was third. At the District Cross-Country, our Year 7 team were third and our Year 8 / Year 9’s were fourth. Lauren B was our highest finisher and came fifth. She has now been selected to represent Central Surrey at the Surrey Cross-Country in January. The curriculum lessons have shown a lot of variety with the Year 9, Year 10 and Year 11’s experiencing sports such as Taekwondo, Lacrosse, Football and Badminton. We are looking to add in more variety lower down the school next term.